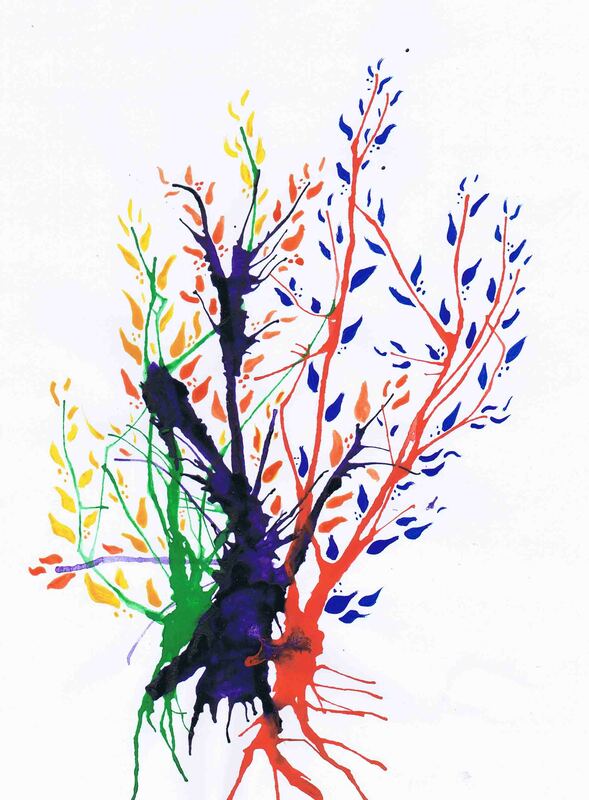 If you ask me, creativity is our birthright. We are all being creative all the time! Whether it’s the way we dress, style our hair, the way we arrange spices on our shelves, the way we walk, paint, draw, dance. Everything that we do is an act of creation. If, like me, you understand creativity to be the act of making something that is unique to you, you realise that you are yourself a constantly changing act of creativity! When people tell me that they aren’t creative I ask them to talk about their dreams, or the games they loved to play as children. Or I give them some plasticine and encourage them to remember what it’s like to roll sausages of colour around each other and squish them into swirls. We can get caught up with thinking that creativity is this big mysterious thing that is only accessible to the gifted, talented, special ones. This is not true! Acknowledging our own creative process and place in the world sometimes requires a little letting go. Letting go of the need to be ‘good enough’ or ‘right’. Letting go of comparisons with others. Letting go of the desire to check with someone else whether our creative output is OK.
And this, I believe, is where meditation can be beautifully helpful. Now when I say meditation, I don’t necessarily mean sitting still for hours on end, legs crossed in lotus position, focusing on your third eye (though if you are able to do that, go for your life!) Many of us need something a little easier to begin with. Something more structured. I have spent years learning about and practising different forms of meditation. I’ve spent time in ashrams in India, learned to do headstands, chanted the names of Hindu gods till my brain poured out of my ears. I’ve danced like a dervish into a spiral of bliss. I’ve sat and held eye contact with another human being until we couldn’t tell where either of us began. I’ve sung prayers at sunrise, taken gong baths, danced for hours on end. I’ve learned to run marathon distances, sat in silence for 10 whole days, used breathwork, candles, mala beads, visualisation…the lot! All of them, ultimately, offer the same experience: sinking, floating, tapping into what I think of as the Matrix or the Zone. It’s this space that fascinates me. It’s what I’ve inadvertently dedicated my life to exploring. When we completely let go we find ourselves in a place of not thinking. It’s a place without reason or judgement. It’s a place where all our stories really do flow. Most of us have had an experience during our lifetime, whether through meditation or something else of being in this Zone. Perhaps during exercise, when playing music, painting or making love. It’s when you aren’t questioning anything. When you’re simply existing, doing, being you. I’m interested in how we can enter that Zone whenever we want. Instead of waiting for inspiration to arrive, what happens if we invite it into our lives? Rather than sitting around chewing pens, what if we enter a state of flow and then just write or paint whatever arises? 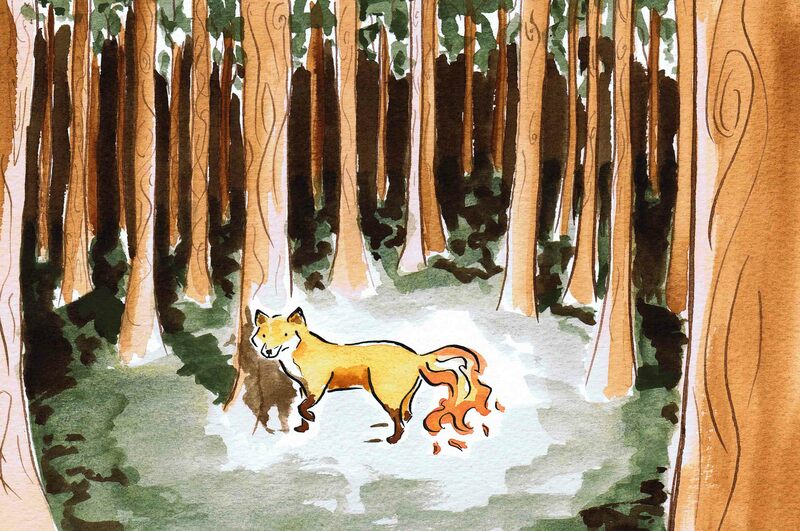 Laura Elliott’s Fox with the Fire Tail is a beautiful example of the sort of surprise that might just emerge! When Laura came on my writing workshop in March, I taught her a number of meditative practices. One technique that she seemed drawn to is very simple. It’s a way of quieting the chattering mind. You give the busy mind something else to do so that your creative thoughts get a chance to peek through. I’m going to describe the process as if I was talking you through. If you can find a friend to work with you, perhaps, at least for the first time, they could read the following to you and you can experience the sinking into flow for yourself. Then you can practise alone. As with everything that you want to get better at in life, you should practise, practise, practise! Sit comfortably. You are aiming to stay conscious and relaxed. Have pencil and paper by your side. Soften your focus. Pick a point opposite you and let your gaze go. Look without really looking! Notice and say aloud three things you can see. It doesn’t matter what they are: chair, book, white … whatever. Notice and say out loud three things you can hear. Now notice and say out loud three things you can feel. It doesn’t matter whether they are internal or external feelings. Textures, temperatures, emotions … all are fine, all are right. Next notice two things you can see. Name them out loud. Now notice and name two things you can hear. Then two things you feel. Name them. Notice the pattern here: 3, 2, 1. Notice and name one thing you can see. Still with your eyes open, notice one thing you can hear. Name it. And one thing you can feel. Your breathing may be steady now and soft. Allow your eyes to close and staying there, sitting upright, eyelids gently resting, notice and name in your mind – silently, inside – one thing you see. This might be imagined. Maybe it’s a colour, a flash of light. Whatever. It’s all right. Just notice what you see. Notice one thing you hear and name it in your mind. And notice one thing you feel, again naming it to yourself. It could be external or internal. Everything is right. Then two things you can hear. And two things you can feel now. Then moving 1, 2, 3. Notice three things you can see, either imagined or real. Lights, colours, shapes, faces,landscapes. Notice and name in your mind three things you can hear. And three things you can feel. Then let your mind go. You might like to imagine a door in front of you. Notice what the door looks like, what it feels like as you reach out to it, how it sounds as you pull it open. Open the door and step through allowing yourself to experience whatever is there for you. Perhaps it’s a full dreamscape. Maybe it’s silence. Perhaps there’s a voice – whose? There’s no right or wrong. Just be there. Listen. Experience. Enjoy. When you’ve spent quality time in that place of calm and stillness and imagination and you feel ready to return, pick up your pencil and begin to write or draw freely, whatever wants to come from the pencil. Forget about spelling and punctuation if you’re writing. Forget about form if you’re drawing. Just fill that page. Keep going, letting the words and images spill out nonstop, keeping the pencil to the page for at least 5 minutes. Go for longer if you can! Play with this process. Practise it every day for a few weeks. See where it takes you! If you enjoy this and want to learn more, please get in touch. I’m in California at the moment where I’m practising a meditation of my own devising called Miracles and Surprises. It’s awesome! I’m also learning new practices in movement and meditation from some fantastic teachers over here. I’d love to share my stories and practices with you and will be running workshops and guided coaching sessions when I’m back in the UK this November. If you’d like to find out more, work with me one-to-one or if you’d like to hang out and have fun, get in touch! I’m available via miraclesandsurprises@gmail.com and on Twitter:@miraclesurprise. I look forward to magical meditations and awesome creativity with you soon!